Epically poetic yet aching personal, “At Eternity’s Gate” may be the best film ever about Vincent Van Gogh. For that matter, it is among the best movies ever made about a visual artist. Undoubtedly much of the insight and emotion radiating off the screen can be traced back to writer/director Julian Schnabel who was, of course, a famed painter long before he began making films. Visually lush and aurally haunting, “At Eternity’s Gate” follows Vincent through the last year or so of his life. It is told in fragmented fashion, with scenes built around a series of dialogues between Vincent (Willem Dafoe in the best performance of his career) and others: his supportive brother Theo (Rupert Friend), his combative fellow painter Paul Gauguin (Oscar Isaac), a fellow patient in a mental institution (Niels Arestrup), a disapproving priest (Mads Mikkelsen), a sympathetic physician (Mathieu Amalric). And when he’s not talking, this Vincent is painting, creating before our eyes the colorful masterpieces that would not be appreciated until long after his death at age 37. A good chunk of “At Eternity’s Gate” is devoted to following Vincent on his nature walks, easel and canvasses strapped to his back, head shaded with a floppy straw hat. This is a transcendental Vincent, a man who stands in the sunshine with his arms outstretched, smiling ecstatically at the light that bathes him. Thus he’s an apologetic mystic, aware that he rubs others the wrong way, but unable to escape the almost epileptic thrall into which he is forever being plunged by the beauty of the world around him. Oscar Isaac is a pretty great actor, but not even he can find a way to make sense of “Mojave,” a mashup of behind-the-scenes Hollywood existentialism and stalker thriller. The film was written and directed by William Monahan, who won an Oscar for his screenplay for Scorsese’s “The Departed.” Alas, “Mojave” has more in common with the Monahan-penned “The Gambler” from 2014. There’s hardly a moment here that rings true…but then maybe that’s all part of Monahan’s view of the emptiness of life in Tinseltown’s fast lane. Or maybe not. It’s hard to care, really. Garrett Hedlund is Thomas, a filmmaker of some renown. His success has bought him a spread in the Hollywood hills (which he is allowing to go to seed) and access to women and drugs. Has this made him happy? As he demonstrated in his breakout debut film, 2011’s “Margin Call” (about the meltdown of a big Wall Street firm under the weight of billions in useless mortgages), writer/director J.C. Chandor is obsessed with capitalism — especially with the odds against being both a successful capitalist and an honest human being. 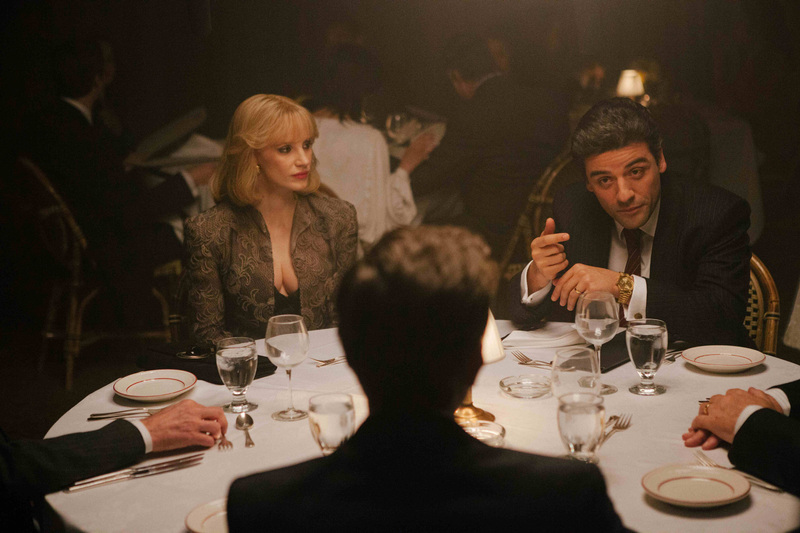 In “A Most Violent Year” he’s at it again, giving us the story of a business owner struggling to maintain his integrity in a business that seems to have little use for it. The setting is New York City in 1981, a year that apparently was remarkable for the Big Apple’s high body county. Curiously, the film isn’t all that violent — at least not physically. Oscar Isaac (who made such a strong first impression in the Coen’s “Inside Llewyn Davis”) plays Abel Morales, the immigrant operator of a heating oil distributorship. As the film begins, Abel is going all in on a major purchase. He’s snapping up a riverside oil storage facility, and to do it he has to put up everything he owns and promise to deliver another huge payment in 30 days. If he can’t raise the cash, he loses everything. That’s just one of Abel’s headaches. His trucks are being regularly hijacked, his drivers roughed up and the fuel oil resold to his competitors. The union boss wants him to start arming his crews. On the home front, he and his young family have just moved into a sprawling, uber-modern home out on Long Island. Not only are the payments killer, but shorty after taking up residence Abel chases away a prowler and finds a loaded pistol abandoned in the bushes outside the front door. Even more threatening, a government prosecutor (David Oyelowo, currently seen as Martin Luther King Jr. in “Selma”) has set his sights on Abel, hoping to make an example of him for the legal fudging that is part and parcel of the heating oil business. Abel is particularly incensed because he scrupulously follows “standard industry practices”…which is to say he cheats, but not nearly as much as his competition. “I’ve spent my whole life trying not to be a gangster,” he protests.